We’re working towards our success - our breakthrough, overcoming moment and fulfillment. We’re searching for ways to live with purpose - to feel like we are contributing something of value, doing the things we love with the people who matter most to us. We’re making strides towards success - more specifically, our success. But true fulfillment is attainable in this moment, and until we can find purpose in the present, we won’t find it in the future. Although there is absolutely nothing wrong with any of the goals listed previously, there is a problem with believing that we can’t live with purpose until we achieve them. Money will only bring so much fulfillment. Starting a business will only bring so much fulfillment. Followers, jobs, and appearance can only fulfill so much in our life. We’ve believed the lie that purpose is easily defined by tangible items, high numbers and personal status. *Newsflash! * Purpose isn’t so easily measured, and finding fulfillment in life is so much more than all of these outward measurements. I once said “When I finish school and graduate college, then I’ll have life figured out. I’ll be so happy, content and fulfilled.” Then the whirlwind of college happened, and I found myself dumfounded, confused and feeling entirely lost. I didn’t feel happy, I most certainly wasn’t content, and I still didn’t know what my purpose was in life. I felt like a newborn baby entering the giant world for the first time, and instead of seeing endless possibility I saw failure, doubt and insecurity… What’s my point? Finding fulfillment and living with purpose is something that is cultivated internally. Right now. When we associate our purpose with factors like money, followers and personal status, we live our lives chasing something that really isn’t fulfilling at all. We live our lives never really feeling content, always chasing the numbers and when we achieve these things, we begin the cycle all over again. Why? Because we’ve falsely defined success. We keep hustling, chasing and pursuing the wrong things instead of finding purpose in this present moment - our current state in life. It doesn't matter what season of life you are in. Whether you are just exiting college and trying to figure out how to pay your bills or you are a successful business owner making six-figures, you will always have something you’re dreaming of and pursuing. There will always be another level, another growth experience and another lesson to be learned. Because this is life. And life requires growth. What is success to you? Really? When we create a realistic and accurate expectation of success - a true definition - then we can begin living with purpose right now. Yes, right now. Because purpose is a life-long pursuit. It’s something that is hard-wired in each of us, and it evolves over time. So, here is our definition of success: Success is when we are living with purpose in authenticity while having influence. Let’s expand on that a little bit. It’s undeniable that each of us have a purpose. The question isn’t “Do I have a purpose?” but rather “Am I living out my purpose?” Like I said previously, purpose is a life-long pursuit, and it is known to transform, morph and change over time. But purpose lives inside of you right now. In this very moment. What burns in your heart? What makes you mad, happy, excited and furious all at the same time? What can you contribute to the world to make it a better place? How can you make a positive impact? All of these questions make us dig deeper. Because purpose is so much vaster than the hobby we’re passionate about. Purpose is when we take our passions and strengths and meet a need in society. We can also associate a successful life with positively affecting culture, helping another person and somehow changing the world. We want to be a part of something bigger than ourselves. We want to stand for something. Ultimately, we want to positively affect the world. When we use our positions in life to positively affect another person, then we have been successful. Whether it’s as big as curing cancer or as small as encouraging a friend, having some kind of positive influence in the world is directly correlated with success. This is our definition of success. Yours may be different depending upon who you are, what you believe and what you value! The important thing here is to truly define success for ourselves. What does that look like to you? 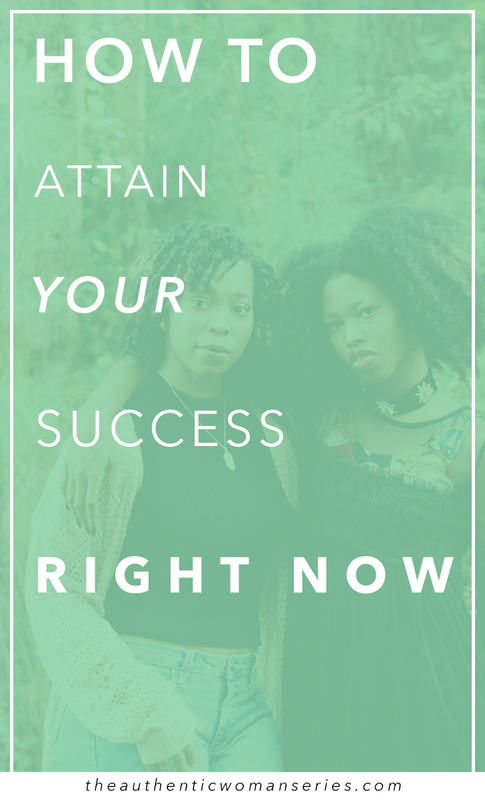 How can you attain success right now… in this very moment? Because it’s at your fingertips. It doesn’t require waiting for the future. It is right now. Share your definition of success with us in the comments below! We would love to hear from you.